individual tastes and requirements are simply too diverse. and wishes of individual musicians worldwide. with a precisely focused sound projection. does not diminish the abundance of colours Perpetual offers. to the most sensitive whisper. this enables the musician to play with an extreme range of dynamics and expression. shifting, string crossings, double stops and chords. The extended reverberation of the Perpetual brings forth an exuberant lustre. an extreme tuning stability is reached immediately after stringing the instrument. which we offer in the gauges 0.26 mm and 0.267 mm. more voluminous tone. Both E-strings are equipped with a removable ball end. and A-string with the 0.26 mm E-string. with a metal or those with a synthetic core. steel core A-string with a chrome-steel winding. this A-string has nothing in common with the traditional steel string. It sounds rounder, more colourful and very voluminous. this new A offers an organic transition with the D-string. this A-string does not burden the body more than the synthetic core A-string. and is therefore compatible with all types of finetuner. 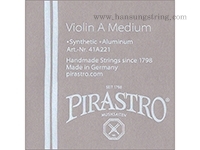 You can check the string tensions of all our strings on pirastro.com. and the 0.267 mm platinumplated E-string are available as singles.